ugustus St. Gaudens was a sculptor. 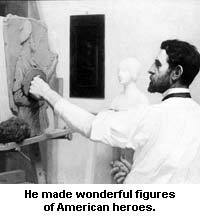 He made wonderful figures of our American heroes. No matter how often we are told of the brave deeds of Lincoln, Sherman, Shaw, and Farragut, we shall remember these men longer because of St. Gaudens's statues of them. Although Augustus was the son of a French shoemaker, named Bernard Paul St. Gaudens, and a young Irish girl of Dublin, who lost her heart to Bernard as she sat binding slippers in the same shop where he made shoes, we call him an American, for a great famine swept Ireland when little Augustus was only six months old, and the young parents sailed to America with all haste. They landed in Boston, where the mother and baby waited for the father to find work in New York. He soon sent for them, and as Augustus and his two brothers grew up in that city and always lived in this country, he seems to belong to us. Shoemakers, as a rule, are not rich men, and Mr. St. Gaudens did not pay very strict attention to his work, for he joined so many societies and clubs that these took his time. His patrons would never have had their shoes made or mended if he had not hired help. Then, also, his sons learned to cobble shoes very young. Before Augustus went into his father's shop to work, and when he had a good many hours out of school, he found the busy streets of New York exciting enough. He was laughing and merry, so that he made friends from the Bowery to Central Park. He had only to sniff hungrily at the bakery to have the good-natured German cook toss him out brown sugar-cakes, and if he fell off the wharves, or ran too near big fire-engines, some kind policeman rescued him. He was not a bad boy. Probably the worst thing he did was to join some other boys in the string joke. They used to tie strings from the seats of the bakery-wagons to the posts of high stoops and watch these strings knock off hats as men hurried by. Sundays were gala days. If the sun shone, all the boys in the neighborhood went over to New Jersey on the ferry-boat. Augustus's father always gave him and his brothers five cents each. Two cents took a boy over to New Jersey, two cents brought him back, and there was the other cent for candy or gum. It was good sport to chase each other through the green fields, hunt birds' nests, and climb trees, but the best fun came on the way back, when the boys sat in a long row at the front of the boat, letting their legs dangle over the edge, watching the life on the river. When Augustus went to school, at the age of ten, he did more drawing on his slate than arithmetic. How the pupils craned their necks to see his pictures! He did not draw just one man, a bird, or a single house, but whole armies shooting guns and cannon. These soldiers looked alive. On his way home, Augustus was apt to draw charcoal sketches on every white house he passed. The sketches were fine, but the housekeepers scolded. Few people noticed the real talent of the boy, but one old doctor became much excited and urged Augustus's father to let him study art. His father had seen very lifelike pictures of his own workshop and cobblers which Augustus had drawn, and agreed that he would do what he could to help him. Only Augustus must for a few more years earn money for the family. So while he went to a night school for drawing lessons, he cut cameos through the day. My, but the man who taught him cameo cutting was cross! Augustus was scolded and driven to work faster all day long. In spite of the terrible rages into which this stonecutter would go, he was very artistic, and Augustus learned how to cut wonderful heads of dogs, horses, and lions, for scarf pins. He made hundreds of lions' heads, and twenty years later, when he was helping his brother model the lion figures for the Boston Public Library, his hands fairly flew, he knew all the lines so well. When Augustus went in the evenings to the drawing classes at Cooper Union, he began drawing human figures and was so eager about his art that he would have forgotten to eat or sleep if his mother had not watched him. As he grew older, he loved art more and more. The only thing else that attracted his eye was the city-full of soldiers, at the beginning of the Civil War. He read the bulletin boards, heard groups of men telling about battles, and his heart ached with love for America. He wanted to go to war to show that love. But his father was now sure that Augustus was a genius and insisted upon his going to Europe to study. The father could not give him much money, hardly more than enough to get him across the ocean, but he could cut cameos to pay for his lessons. Augustus stayed in Paris a year. He made friends among the artists just as he had made them when a child in New York. Then he worked four years in Rome. He had a hard time there and grew thin for want of food and sleep, but he was as eager as ever and worked faster and harder than before. People began to visit his studio and always went away full of praise for the talented young man. Rich Americans visiting in Rome urged him to return to this country. They gave him orders, and he finally came back to America, where he was kept busy on busts and medallions until he began to have orders for monuments of great Americans. This was work he liked. He loved America, and he was proud of her heroes. Perhaps he loved Abraham Lincoln best of all. He had seen Lincoln a good many times, and he had read and studied about his beautiful life until every line of that man's face and figure was clear in his mind. Still, when he was asked to make a statue of Lincoln for the city of Chicago, he worked on it many years. On his statue of General Sherman which stands in Central Park, New York, he labored eleven years. On the beautiful Robert Gould Shaw monument which stands in front of the State House in Boston, he spent twelve years. This does not mean that he stood with clay in his hands all this time, but that from the time he began to plan what he would draw into the statue, what size it ought to be, and whether the man should be standing or sitting, until it stood all finished, he thought and worked a long, long time. His work is almost perfect, and fine work always takes time and patience. When busy on the Gould Shaw monument, St. Gaudens often stood on a scaffolding ten hours at a time in the hottest summer days, not eating anything but an apple. He was so eager over his work that he did not want to lose a minute. But he had some fun as well. The horse he used as a model used to get terribly tired of standing so long and would snort and prance and paw the ground until it took several men to hold him. And some of the negroes who posed nearly fainted when they saw St. Gaudens make faces that looked exactly like them with just a few pinches of his fingers on the soft clay. They thought he was in league with Satan, they said. When you see this monument, you will notice how brave Colonel Shaw looks, riding on his large horse, and how eagerly the colored troops march behind him. St. Gaudens was very fond of Phillips Brooks, the good Bishop, and because of their friendship, his statue of Brooks at Trinity Church, Boston, is so like the man that you almost expect to hear him speak, as you stand before it. St. Gaudens had been to concerts with Bishop Brooks, had heard him preach, had seen him merry and sad, knew how unselfish he was, and how much he liked to cheer people up, and somehow managed to make his statue tell us all these traits. There is no doubt St. Gaudens was one of the world's great sculptors, but he would never have been great if he had not loved his art so well that he could go hungry, cold, and tired year after year for the sake of learning it. And he was great because he was so determined to do his work over and over again until he felt it was just right. He always urged students to do the same. "You can do anything you please," he often said; "it's the way it's done that makes the difference." Besides becoming famous, the shoemaker's son was happy and rich in the end. He had a wife and a son who, among other books, has written a life of his father. From this book and by the stories St. Gaudens's friends tell of him, we know that the sculptor was a gentle, loving man who tried to help the world to be better and wiser. It will not matter whether it is the statue of Sherman, Logan, Lincoln, or Shaw by St. Gaudens that you are fortunate enough to see; it will be the way any piece of his is done which makes it so beautiful, and which makes Americans glad that almost every bit of his work has stayed in this country.